Turkish Airlines, the Official Airline Partner for EURO 2016 takes off on its maiden flight to Paris. To celebrate EURO 2016 this summer, Turkish Airlines has unveiled an A330-300 passenger aircraft painted in the competition’s livery. 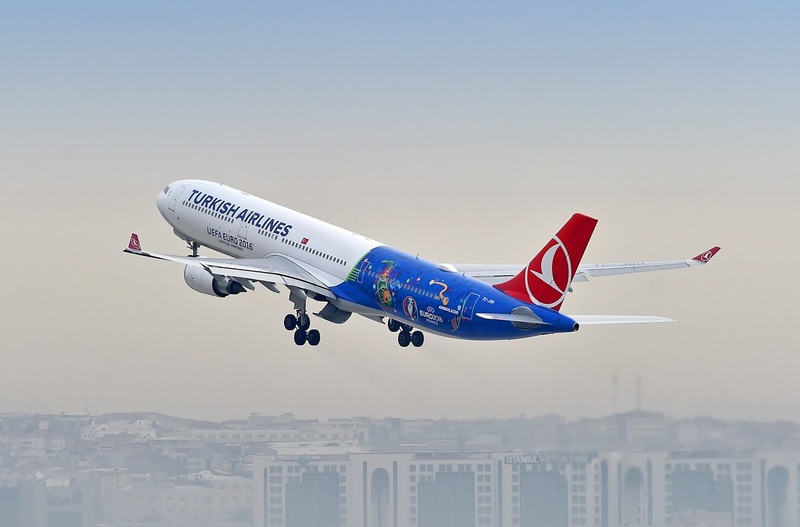 The plane undertook its maiden flight to Paris the location of this year’s final on 10th July, and is just one component of Turkish Airlines’ drive to excite fans ahead of this year’s tournament. The livery was created by UEFA and Turkish Airlines as part of airlines’ partnership with the competition and role as Official Airline Partner to Euro 2016. The sponsorship will also see the airline announcing a series of ticket giveaway competitions; unique EURO 2016 airport experiences for passengers; and a series of fan zones throughout the host French cities once matches get underway in June. As Europe’s best airline for fifth consecutive time*, Turkish Airlines takes an active interest in the continent’s sporting competitions and cultural events. Football’s global appeal, and its unifying force, is reflective of the position as the carrier that flies to more countries than any other airline. 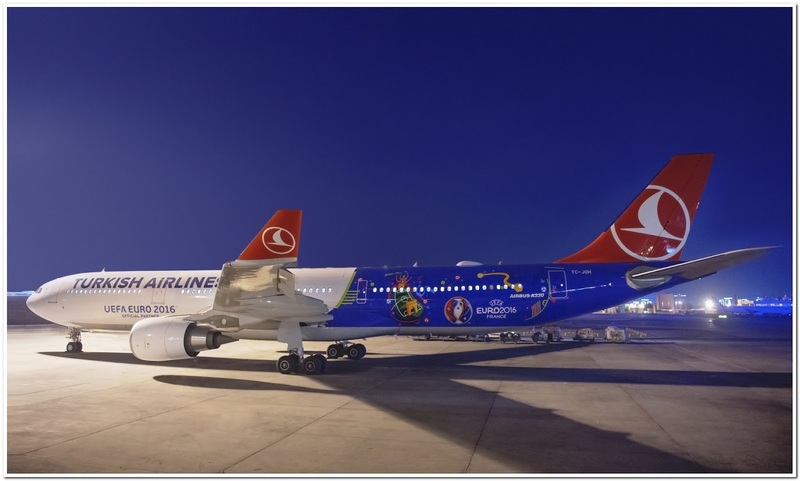 The plane wrapped in the EURO 2016 colours will fly to a selected number of destinations across the Turkish Airlines’ network. The airline currently flies to more than 280 destinations. Fans of the plane and the competition can engage on social media with the hashtag; #eurointhesky. Established in 1933 with a fleet of five aircraft, Star Alliance member Turkish Airlines is a 4-star airline today with a fleet of 308 (passenger and cargo) aircraft flying to more than 285 destinations worldwide with 236 international and 49 domestic. According to a 2015 Skytrax survey, Turkish Airlines was chosen as “Europe’s Best Airline” for the fifth and “Best Airline in Southern Europe” for the seventh consecutive time. Having won in 2010 the world’s “Best Economy Catering Service”, in 2013 the world’s “Best Business Catering Service”, and in 2014 “Best Business Catering Service” awards, Turkish Airlines was awarded the world’s “Best Business Class Lounge Dining” and “Best Business Airline Lounge” prizes in the 2015 Skytrax survey. More information about Turkish Airlines can be found on www.turkishairlines.com. The Star Alliance network was established in 1997 as the first truly global airline alliance to offer worldwide reach, recognition and seamless service to the international traveller. Its acceptance by the market has been recognized by numerous awards, including the Air Transport World Market Leadership Award and Best Airline Alliance by both Business Traveller Magazine and Skytrax. The member airlines are: Adria Airways, Aegean Airlines, Air Canada, Air China, Air India, Air New Zealand, ANA, Asiana Airlines, Austrian, Avianca, Brussels Airlines, Copa Airlines, Croatia Airlines, EGYPTAIR, Ethiopian Airlines, EVA Air, LOT Polish Airlines, Lufthansa, Scandinavian Airlines, Shenzhen Airlines, Singapore Airlines, South African Airways, SWISS, TAP Portugal, Turkish Airlines, THAI and United. The integration of Avianca Brasil is currently in progress. Overall, the Star Alliance network currently offers more than 18,500 daily flights to 1,321 airports in 193 countries For additional information visit www.staralliance.com and/or follow us on Facebook, Twitter, Youtube or LinkedIn.